Gaming: Will Android ever close the gap on iPhone? Today Mplayit released yet another batch of data regarding the relative interests of iPhone users vs. Android users vs. BlackBerry users based on the Mplayit community in Facebook. Unlike the data on apps, however, the data on games paints a less comparable story. The iPhone has a clear lead in not only the sheer number of games (not surprising) but also the level of interest our users have in games. In our community, 50% of iPhone activity is directed at discovering games compared to 30% on BlackBerry and 20% on Android. From the chart below you can see that all of the major gaming categories are covered across platforms, but as you drill down off the chart on BB and Android we see a lack of depth in each category versus the iPhone. Not surprisingly, we see Android users preferring more 'geeky' games due to the early adopter nature of the user base. So the question remains, will Android and BlackBerry ever catch up to the iPhone as a gaming device? I suspect the answer will be yes for Android and no for BlackBerry. While BlackBerry will continue to support a healthy gaming environment (driven by the fact that top publishers have been supporting BB for years and the operator infrastructure that exists for fulfillment and billing), the current devices simply aren't designed to be powerful gaming devices. Android, on the other hand, has all the potential in the world. As devices, their gaming potential is arguably as high as the iPhone. The limiting factor today is the Android Marketplace and the relative difficulty of payment. Developers will ultimately follow the money and if no money is being made in Android only the hobbyists will stay around. I'll keep you posted on what we continue to see. San Francisco – Feb. 4, 2010 – On the heels of Apple’s iPad announcement, Mplayit today released a survey that underscores iPhone users’ strong interest in mobile games as compared to Android and BlackBerry users on Mplayit’s popular app store on Facebook. With games making up only 20 percent of the over 130,000 iPhone apps available on the Mplayit site, nearly 50 percent of the site traffic centered on games. Among Android users, only 20 percent of browsing focused on gaming applications. Even BlackBerry users are more fun-loving than Android users, with about 30 percent of activity coming from the games category on the Mplayit site. Mplayit is the company best known for its groundbreaking new social mobile app store on the Facebook platform supporting the full application catalogs for iPhone, BlackBerry, and Android devices. Users can rate, comment, and recommend individual apps to their social network on Facebook and Twitter, in addition to browsing friends’ app collections and following their interests. Mplayit's findings, drawn from live data collected from over 50,000 users of its Facebook app store over a two week period ending January 29, highlights the kinds of games that were popular for each of the three major smartphone audiences. 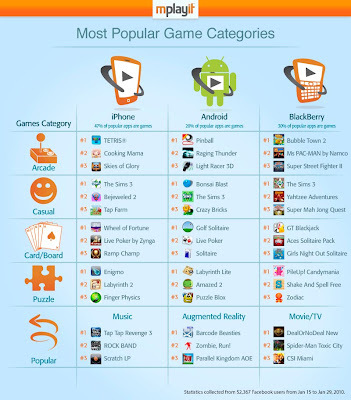 The most active game categories on all three platforms were largely identical: Arcade, Casual, Card/Casino, and Puzzle. However, there were some significant differences in taste across platforms. Music games were particularly popular on the iPhone, befitting its media-centric iPod heritage. Android users showed a predilection toward 'geeky' games making innovative use of things like the GPS, camera, and augmented reality. And the BlackBerry audience gravitated toward television and movie tie-ins. There were also some significant commercial differences. BlackBerry users stuck with major franchises and larger publishers, reflecting perhaps the carrier-centric history of the device. Indie developers hold their own against the big games publishers on the iPhone, and continue to dominate the Android's relatively immature market.